We have 7 premium carpet courts, 3 state of the art artificial clay courts, 3 hard courts, 2 mini-tennis courts and a hitting wall available all year round (and in all weathers). 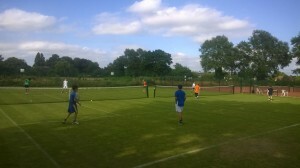 There are also 2 well maintained grass courts for the summer season. Five of the artificial courts have floodlights and can be booked outside the office or through the Tennis Administrator. Courts are generally available on a “turn up and play” basis but at some times priority for courts is given to certain types of play determined by the Order of Play. However, you will always get to play some tennis no matter when you turn up. Non-members are welcome to hire courts at certain times (please contact the Tennis Administrator for more details). 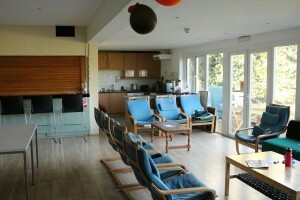 Our clubhouse is always a friendly place to wind down after tennis or get “in the zone” ready for a match. The clubhouse has Men’s and Ladies’ changing and shower facilities, together with a kitchen, licensed bar, table-tennis, table football, drink & snack machine, television and, of course, the Pro-Shop and Club Office. Run by Karen & Mark Goodman (both members of CLTC), Top Spin Tennis are the only racket sports specialists in Cambridgeshire. 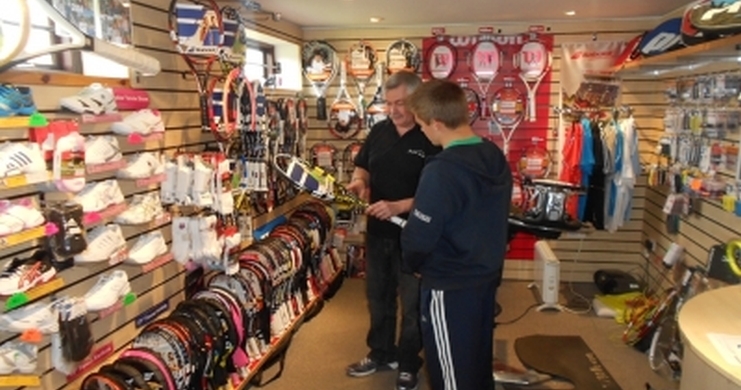 The shop provides everything needed by a tennis player – from rackets and balls through to the latest clothing and shoes. You will always receive expert advice from the Top Spin Tennis Crew! See the Pro-Shop page for more information.